WGN America has ordered the drama series Salem from award-winning producers Brannon Braga (24, Star Trek: TNG, Voyager & Enterprise) and Adam Simon. The series hails from Fox 21 (Homeland, Sons of Anarchy), the prolific cable production division of Twentieth Century Fox Television, and marks the first original scripted series for WGN America as it begins to aggressively expand its programming slate. Set in the volatile world of 17th century Massachusetts, Salem explores what really fueled the town's infamous witch trials and dares to uncover the dark, supernatural truth hiding behind the veil of this infamous period in American history. In Salem, witches are real, but they are not who or what they seem. The show, which centers on an epic romance wrapped around this explosive revelation, delivers a bold new vision of Salem – and an even bolder new vision of witches. WGN America has ordered 13 episodes entering production this fall in for a 2014 premiere. The series was created and written by Brannon Braga and Adam Simon, who will serve as executive producers alongside Prospect Park's Josh Barry and Jeff Kwatinetz. The series will be produced by Fox 21. Stay with us for continued updates and maybe soon an original sitcom will make its way to WGN America in the future? 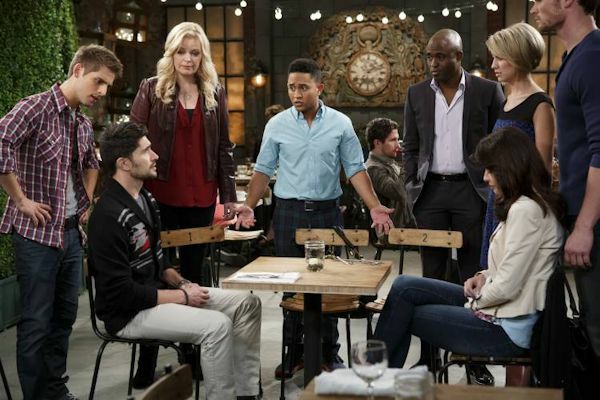 ABC Family's New Comedy Wednesday sitcom starring an ensemble young cast lead by Jean-Luc Bilodeau and Chelsea Kane, airs Wednesday nights at 8:30pm and we have just the next episode that airs tonight (June 5). And it's a Kyle XY reunion with Matt Dallas guest starring! In the episode airing tonight, "There's Something Fitchy Going On," Ben (Jean-Luc Bilodeau) discovers a shocking secret about Riley's (Chelsea Kane) new beau, Fitch (guest star Matt Dallas, Kyle XY), and tries to warn her. Meanwhile, Bonnie (Melissa Peterman) accidentally sends a revealing message from Danny (Derek Theler) to Riley's cell phone. Things heat up between Danny and his new model girlfriend, Milena, and Tucker (Tahj Mowry) pounces on an opportunity to shine with his boss, Chase (guest star Wayne Brady). What the "fitch" is going on? Last week on the season premiere we ended the episode with Riley meeting a new guy at a law firm party and both Ben and Danny were too late. We continue that arc in this episode but it doesn't seem it is literally right away because Riley and Fitch have started a relationship. It's probably at least a few days or a week after the law firm party, we're guessing. It's unclear but the episode is still good. We have a lot of laughs and a lot of crazy antics. Obviously the main storyline is for Riley and Fitch and what Ben thinks about it and what he will do. Ben learns a secret about Fitch by accidentally seeing something he shouldn't have seen (a classic sitcom device). Is Fitch really a good guy? We also have a comical storyline with Danny and Bonnie regarding Riley's cell phone. He left her a voicemail by accident and they try to get a hold of Riley's phone before she sees it. Will they succeed? It's a lot of fun. And the final storyline is with Tucker and his new "hands-on" celebrity boss Chase. Wayne Brady is very funny as Chase and he can't keep his hands off of women. Looks like we might see more of him, but in this episode we don't have much of him.